Climate-Based Daylight Modelling (CBDM) can be defined as the assessment of the luminous conditions within the built environment that makes use of representative climate data to recreate realistic sky luminance distributions, at hourly or sub-hourly consecutive steps, by means of physically accurate lighting simulation tools. CBDM made its appearance among other Building Performance Simulation disciplines relatively recently, marking a profound change from the previously established daylighting analyses, such as the Daylight Factor and Sun Path diagrams. Daylight metrics derived from CBDM now appear in building guidelines, and CBDM evaluations are becoming widespread in design practices since they have proven to be a powerful tool to extract a wealth of information on the daylighting annual performance of buildings. However, despite the now widespread use of CBDM, the findings of this thesis showed that the accurate representation of direct sunlight still poses significant challenges for current simulation tools, due to its high intensity, variability and directionality. This has important consequences for any evaluation that depends on the effects of sunlight and indicates that further research in the field is required. The objectives stated in the thesis aimed at broadly assessing the applicability of CBDM by looking at multiple aspects: (i) the way CBDM is used by expert researchers and practitioners; (ii) how multiple state-of-the-art simulation techniques compare to each other and how they are affected by uncertainty in input factors; (iii) how the simulated results compare with data measured in real occupied spaces. The answers obtained from a web-based questionnaire portrayed a variety of workflows used by different people to perform similar – if not the same – evaluations. At the same time, the inter-model comparison performed to compare the existing simulation techniques revealed significant differences in the way the sky and the sun are recreated in each technique. 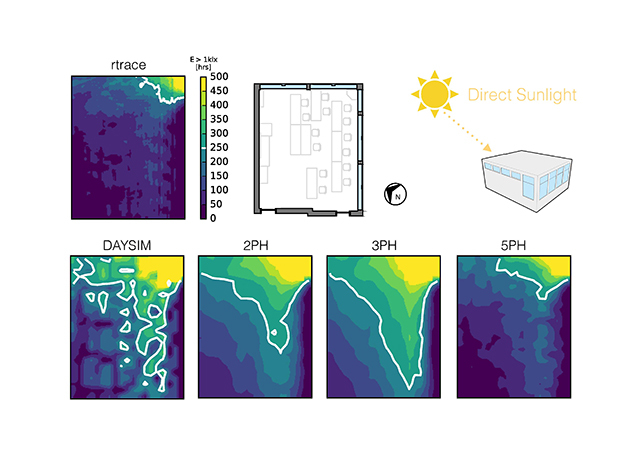 The results also demonstrated that some of the annual daylight metrics commonly required in building guidelines are sensitive to the choice of simulation tool, as well as other input parameters, such as climate data, orientation and material optical properties. All the analyses were carried out on four case study spaces, modelled on existing classrooms that were the subject of a concurrent research study that monitored their interior luminous conditions. A large database of High Dynamic Range images was collected for that study, and the luminance data derived from those images could be used to extend this work to explore a new methodology to calibrate climate-based daylight models. The results collected and presented in this dissertation illustrate how, at the time of writing, there is not a single established common framework to follow when performing CBDM evaluations. Several different techniques coexist but each of them is characterised by a specific domain of applicability.